I’ve actually had You on my shelf for a good few years now. I picked it up right when i started Uni (i think) as i found it cheap and liked the sound of it. As the years passed, i’d heard more and more mixed reviews that honestly put me off reading it. Then the announcement of the Netflix series came around, and well, i picked it up. I’ve spent a lot of time since Christmas watching Gilmore Girls. I never thought it would be my ‘thing’, however fell very quickly and deeply in love with the characters and Stars Hollow. I want to be in Gilmore Girls basically. I was browsing book tags and found the Gilmore Girls Book Tag. Why not combine books and Gilmore Girls in to one thing? My two loves and passions. I read Thirteen Reasons Why not so long ago, and enjoyed the story. The writing was okay and it had a unique twist on a teen suffering with mental health issues, being told from someone else’s point of view. However, recently the Netflix adaptation has been released and watched by millions, spreading this story further. The whole world seems to have been taken over by Stranger Things. If you don’t have a Netflix account or haven’t been online in the last few months, Stranger Things is an 80’s throwback sci-fi series that revolves around three friends trying to find their disappeared friend, this is with the help of an escapee paranormal science experiment. Sounds good right? Because it is! I absolutely loved the series so when i found this tag online, i had to join in with it! Here’s the tag and my answers. With her career, live-in boyfriend and loving family, Piper Kerman barely resembles the rebellious young woman who, over a decade ago, got mixed up with drug runners and delivered a suitcase of drug money to Europe. 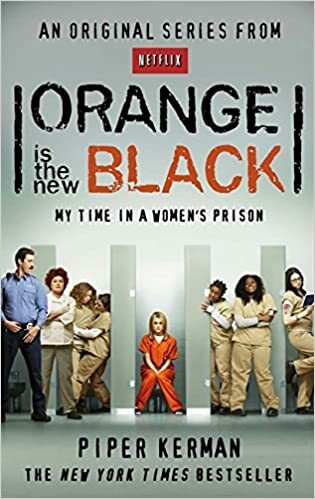 But when she least expects it, her reckless past catches up with her: convicted and sentenced to fifteen months at an infamous women’s prison in Connecticut, Piper becomes inmate #11187-424. From her first strip search to her final release, she learns to navigate this strange world with its arbitrary rules and codes, its unpredictable, even dangerous relationships. And she meets women from all walks of life, who surprise her with tokens of generosity, hard truths and simple acts of acceptance.